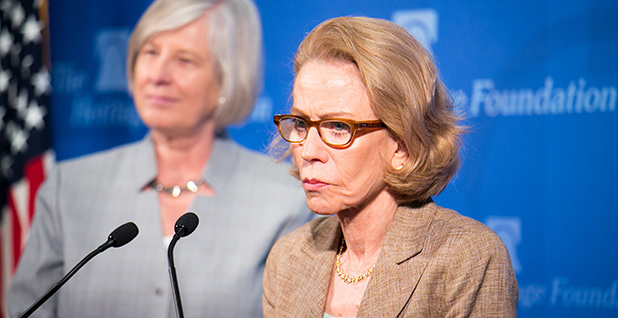 Council on Environmental Quality nominee Kathleen Hartnett White, one of the White House's most controversial staffing choices, may be stuck in the Senate. White cleared the Environment and Public Works Committee last year on a party-line vote, but strong Democratic opposition meant the White House had to renominate her this month. And her problem is not only with Democrats. EPW Chairman John Barrasso (R-Wyo.) was cautious when addressing White this week. "We'll come back to committee, and we'll get her up for a vote again," he told E&E News. Asked whether he was pressing other Republicans to support her, Barrasso said he was "working on all the president's nominees." White's opponents were hoping the president would not renominate her. When he did, EPW ranking member Tom Carper (D-Del.) responded: "Well, they should expect a fight." Carper is following through with that threat. "It's not just Democrats who are deeply troubled, there are Republicans, as well," he said this week. White's critics see Republicans such as Sens. Lamar Alexander of Tennessee and Susan Collins of Maine as possible no votes. That would be enough to sink the nomination. White has written books including "Fueling Freedom: Exposing the Mad War on Energy," with conservative scholar Stephen Moore, and "Fossil Fuels: The Moral Case." Alexander told E&E News before the Christmas recess he planned on reading some of her work, but said he still had some catching up to do. "I didn't get it done. I still have it, though," he said last week. Asked whether he would meet with her, Alexander said, "Well, I'm going to read her book and see." Collins yesterday said she had also not met with White but was familiar with some of her statements at her nomination hearing. "I've seen some excerpts from the hearing," she said, "but I haven't seen the whole hearing, so I don't know whether they were in context or whether they represent how the hearing went in general." White is not only a defender of fossil fuels but has questioned climate science and touted the benefits of carbon dioxide. And even though she appeared to moderate her comments last year, critics panned her performance (Greenwire, Nov. 8, 2017). Carper said it was "maybe the most painful testimony I've ever witnessed in my 17 years here." The ranking member added it was "mind-boggling to watch someone so poorly prepared to undertake a position of this responsibility" and "to walk back what she said for 10-15 years, what she said on environmental issues." Senate Energy and Natural Resources Chairwoman Lisa Murkowski (R-Alaska) said this week she has not met with White but was aware that her nomination was sent back to the White House at the end of last year. Given that White was renominated, Murkowski indicated that she may study White's positions. "I don't know her, and given what's been talked about, I suppose I should find out," she said.